Have you had a difficult time attracting a healthy love relationship? Whatever the subconscious mind believes is what will come into your life, and it is time to break that Negative pattern! Glynis has created this CD set in which you repeat special Love Affirmations daily for 15 minutes. You recite them right along with her, and there are seven different Affirmations to choose from, so you can mix it up! Through the years, over a thousand of Glynis' clients have found true love by using these affirmations daily. Glynis also credits these affirmations (and Numerology :)) for bringing her wonderful husband Charlie into her life, so SHE KNOWS that they do work! 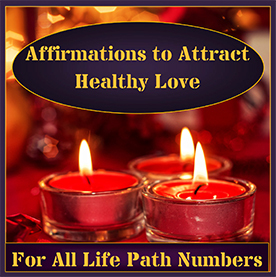 When you use these Love Affirmations, they will reprogram your inner expectations and you will finally attract the healthy love you so deserve!